On the left of bottom frame, one audio rate envelope feeds the clock input on the left of the DDSR. The other envelope also acts at audio rate and is controlled by 2 of the CV outs from the CTL1 via the arcade manifold (turns CV feed on/off). This envelope feeds the audio input on the right of the dual amplifier module. This amplifier is modulated by 2 looping envelopes (right hand side of the skiff). The right envelope speeds up and slows down in time with the slower left one.. These are both fed into the left hand VCA which then feeds the right hand amplifier cv input. The left hand vca is also modulated by the slower envelope. This signal is fed into the spring tanker, whose filters are also modulated by the left hand of the dual amplifier. CTL1 gate output advances the right side of the DDSR on a step with each touch, the D/A outs of which change the attack and decay lengths on the envelope clocking the left hand side. Pressure outs control the cutoff of a Bugbrand filter and a Stroh Optogate, which are fed a gate out and a D/A out from the audio rate side of the DDSR. The clocking envelope is also fed to the arcade manifold to then be routed to the gate in on the CTL1 and the reverb gain cv on the spring tanker. Left hand side of the dual filter is used in sub mode to slew the pressure out cv feeding the right hand filter. Highly recommend headphones.... it's fairly dynamic so watch out for screams. Also i recorded through a portable mixer that can't really handle these levels onto a minikp2 (provides extra room verb) so there is a bit of noise and bleed on the recording. Love the tones you are getting with this, full of brass and woodwind timbres. Great stuff. I find it a lot of fun to feel your way around a patch like this that invites tactile playing, I've been doing too many complex rhythmic patches lately where there's so much going on I'm too afraid to touch anything for fear of wrecking it. I get my voltage memory back this week which should hopefully remedy that situation! Speaking of which I put together a 2 framer and a 10fw control skiff this morning to try jam on tonight - will do a vid if it bears fruit! & I like the idea of shifting around setups within 2 or 3 frames - it really changes the instrument while still maintaining some experience as you know the building blocks. Yeah I'm going to keep doing this for a while, feels a bit more manageable - when I sit in front of 4/5frames stuffed with modules my head starts to spin as seem to gravitate towards patching everything into everything and completely lose the plot! Which is enjoyable for sure, but not very productive for me right now . 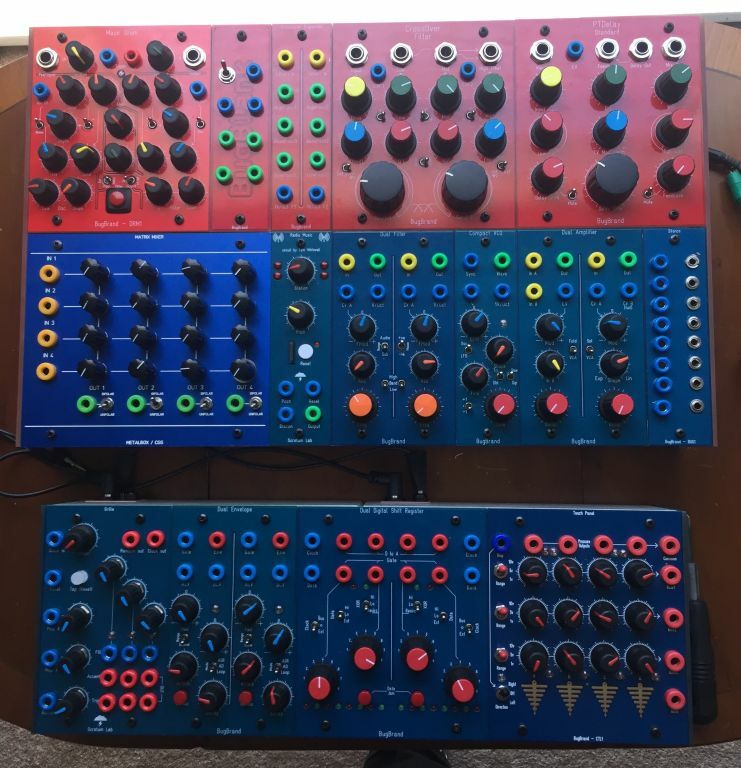 I think as I learn the modules more and more in smaller setups I'll become a bit more wise to how best they'll work for me in the wider system. So well assembled that it can take part to the next beauty contest!!! BTW Chris, what is the Scrotum Labs Modules in the bottom right corner? Some nice diy there Chris, have you thought about converting any other eurorack diy projects to bug format. Guess you'd be opening a real can of worms there! I can drill (wonky) holes and solder jacks and stuff (see the makeshift DRM1 expander in the pic, or my format jumblers and diode/cap switches in the DIY thread), maybe even desolder something large from a board, but definitely not much else! Batchas (scrotum lab) made the grids and radio music conversions, and they really are a fine piece of work - a testament to the amount of effort he puts into getting a perfect working, looking and feeling module to accompany Tom's own masterworks.